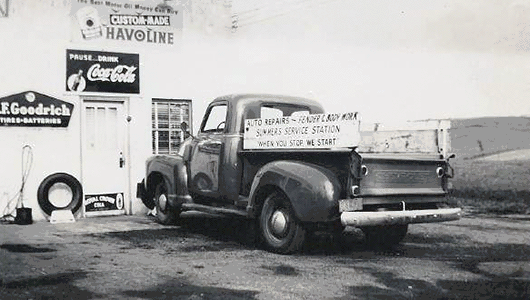 In 1947 Summers Service Station opened its doors for business. Owned and operated by Oscar and Walter Summers respectively, the business started with one tow truck, a parts yard, and gas station. The success of Summers Service Station meant the towing and repair facility would need expand its offerings to include emergency roadside service; one of first to do so in the Morgantown, West Virginia area. As Morgantown continued to grow, so did the need for recovery and towing services. Summers would soon need to find more space. In 1978 the parts yard was sold, and the shop moved to its present location on Ackerman Road, near the future location of Mountain Valley Apartments. After the move, Oscar and Walter retired, passing the company to Darrell Summers (son of Oscar). From the ’70s through the turn of the century, Summers Towing has matured to a prosperous, professional company with a fleet of light and heavy duty wreckers, rollbacks, road service trucks, and snow plows. Today, Summers Towing and Repair Inc. is co-owned by Darrell & Kevin Summers. Together with their team of trained employees, Summers Towing continues to provide the safest recovery, 24-hour response at highest quality and fair prices. The Summers fleet is over 20 trucks strong, including light/heavy duty recovery services as well as an onsite 5-bay repair shop. Son of Oscar Summers, and second generation owner of Summers Towing. In 2016 Mr. Summers retired, but continues serve an advisory role. Son of Darrell Summers, and 3rd generation owner of Summers Towing. Kevin’s history with the company began at age 15, culminating with his title of president in 2016. A valued member of our team since 2005, Mike started his career with Summers as a Light Duty Operator. Today, Mike oversees operations as Manager, and is an Operator of our Heavy-Duty recovery. In 1975, Randy joined the team under Oscar Summers. From light duty repair, to specialty recovery and heavy duty recovery. Randy is one of the most versatile operators in the business today.